Today is another in my miniature teapot series. These teapots from Avon are very small and definitely not functional as the warning on the bottom of each warns against using them for food purposes. I think this asparagus one is my favorite in the vegetable series because it just is unique and maybe also because I love asparagus. Whatever the reason—I love this little guy and think he will be around for a long time even if I can’t brew a cup of tea in him. Fun collection. I did a post on Thanksgiving salt and pepper shakers a while back. Another cutie. I can see how it is a favourite of yours. I love asparagus too! These teapots will go with you to your new home I imagine. Great quote. It’s a sweet little teapot.. I love asparagus too… grilled with olive oil! 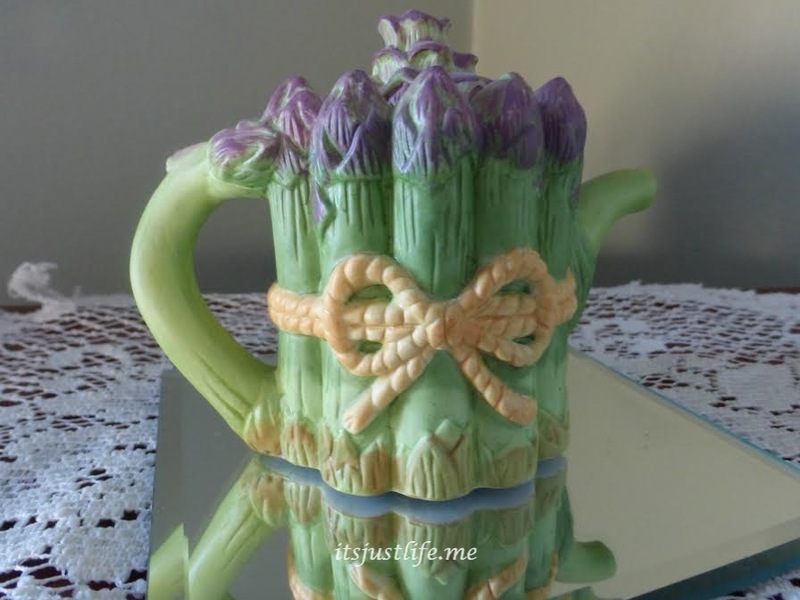 What a sweet and cute teapot Beth Ann, definitely agree that it’s a keeper. Today’s teapot makes me hope for spring!! Absolutely love the quote, too!! Great job. There are still Avon ladies but I think most of their sales are probably online now instead of door to door. No one has time for door to door sales folks anymore, do they? I think that’s the cutest asparagus I’ve ever seen! I know, right? But don’t drink out of this one—it’ll kill you according to the label! Another cute one. And asparagus? Yum. Grilled with olive oil and a little parmesan cheese sprinkled on top. I don’t use the parmesan cheese but just grill it—how come it took us this long to figure out we could do that? All the rage now but years ago who knew? Love that quote! And the veggie teapot, too! Thank you, Debbie! It is a cute one for sure. Oh, it’s so sweet! And I love that quote…. Everyone loves the quote today! Me, too! Hope you are staying warm. I have to catch up on your adventures! I wonder what asparagus tea would taste like? lol I love them too. I wonder if you’d be so enamored with it if it were ‘carrots’ instead of asparagus. LOL – love that quote at the end. adorable little teapot! I would keep jelly beans in it.. even though I do love asparagus too. but I like jelly beans better. Jelly bean holder it is now! Thanks for the idea! Or M and M’s……now I have a conundrum. That is THE cutest tea pot, ever! But then, I too love asparagus as well so seeing this beauty makes me crave it now. Thanks, Denise! I love it as well. I love asparagus—grilled with a bit of olive oil and sea salt. Yum. Now I have to go to the store! I love it! I also love asparagus! I love the colors on this one though! Green & purple happen to be one of my favorite color combos! I never really thought that green and purple went together but I am a believer now—-I see so many great designs with those two colors featured and it works! I love asparagus any way I can get it but grilled or roasted tops the list. Yum. The colors for our wedding were black & lime green with purple accents! 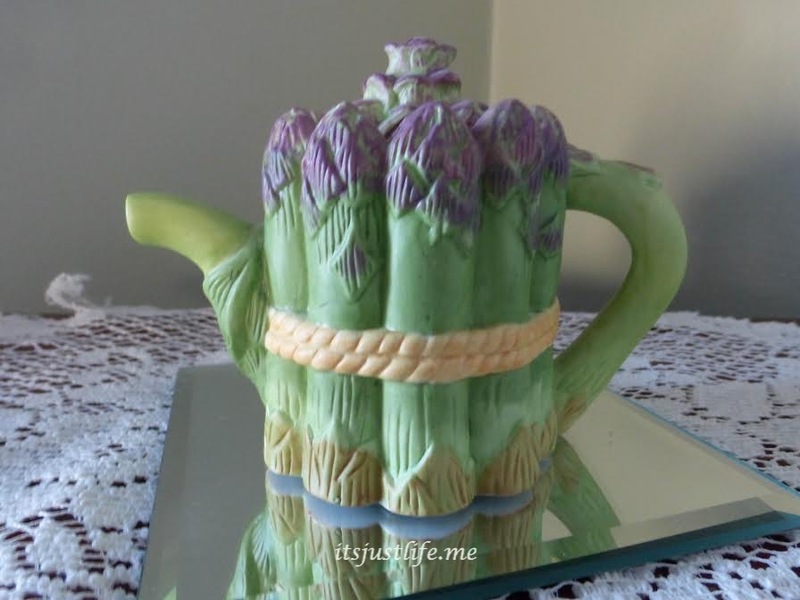 An asparagus tea pot? Now I’ve seen everything :-D. And this everything is very cute. The asparagus i grow in my small garden is not as pretty as your teapot. I also like asparagus.